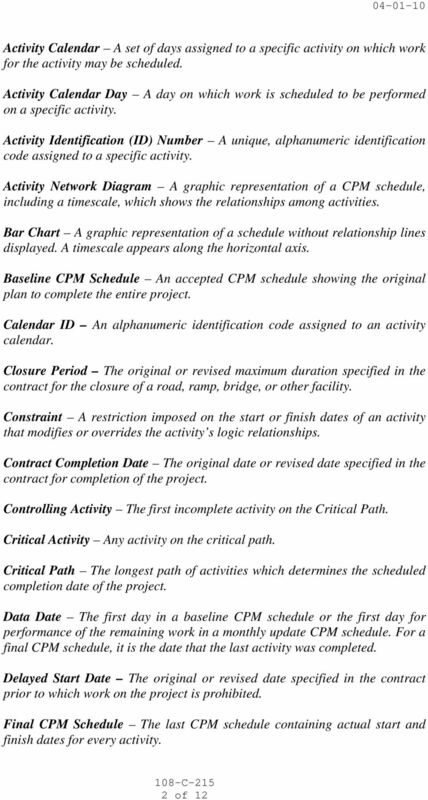 Download "108-C-215 CRITICAL PATH METHOD SCHEDULE. (Revised 03-24-10)"
5 5 of rejection will be identified. If the Engineer does not respond in writing to the submittal of a schedule within the allotted time, the schedule shall be considered to be accepted. The Engineer s written notice of acceptance or rejection may include questions, comments, or request additional information. 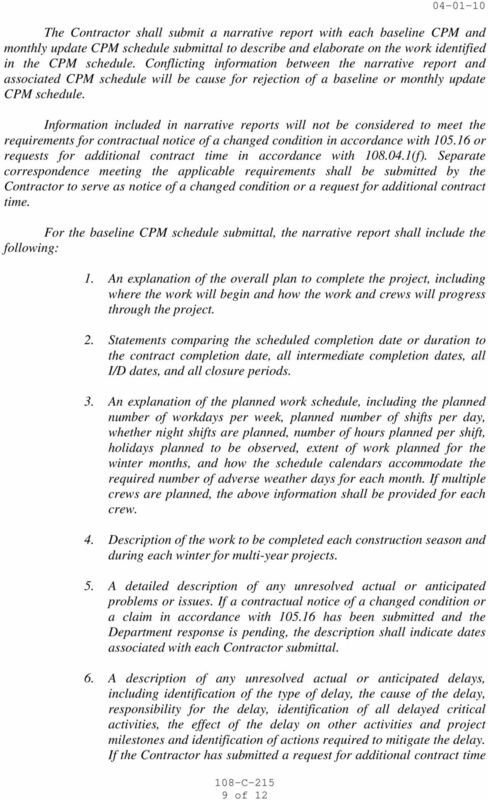 The next CPM schedule submittal s narrative report shall address all questions, comments, or additional information requested by the Engineer. Rejected baseline CPM schedules shall be resubmitted until accepted by the Engineer. 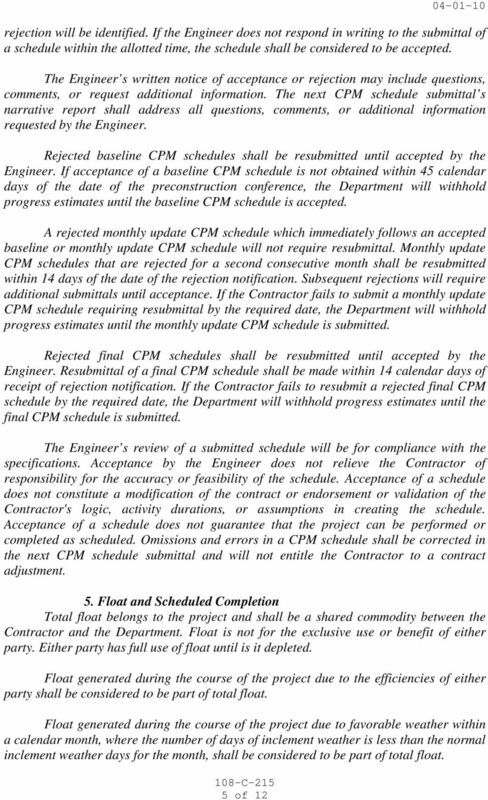 If acceptance of a baseline CPM schedule is not obtained within 45 calendar days of the date of the preconstruction conference, the Department will withhold progress estimates until the baseline CPM schedule is accepted. A rejected monthly update CPM schedule which immediately follows an accepted baseline or monthly update CPM schedule will not require resubmittal. Monthly update CPM schedules that are rejected for a second consecutive month shall be resubmitted within 14 days of the date of the rejection notification. Subsequent rejections will require additional submittals until acceptance. 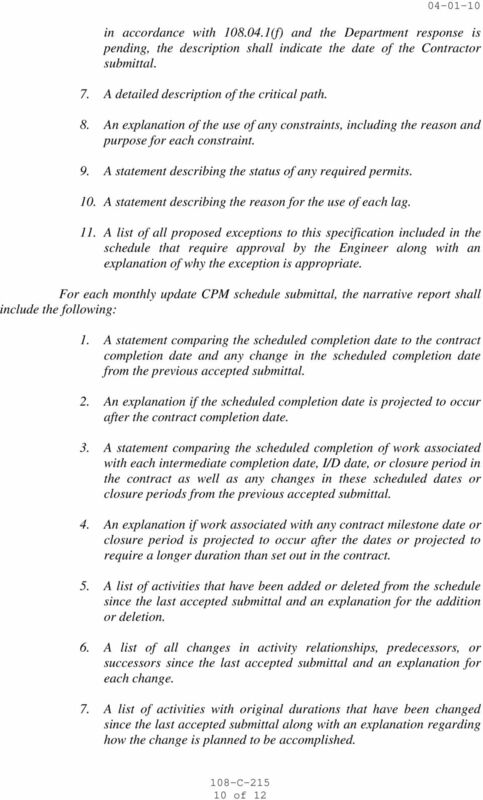 If the Contractor fails to submit a monthly update CPM schedule requiring resubmittal by the required date, the Department will withhold progress estimates until the monthly update CPM schedule is submitted. 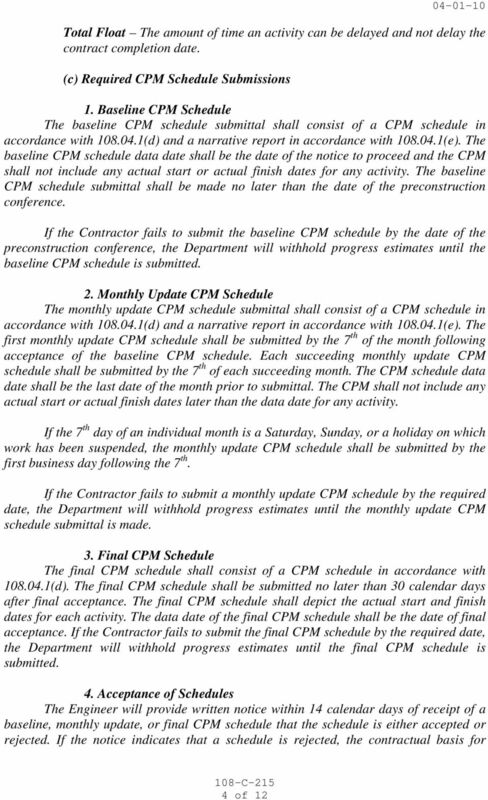 Rejected final CPM schedules shall be resubmitted until accepted by the Engineer. 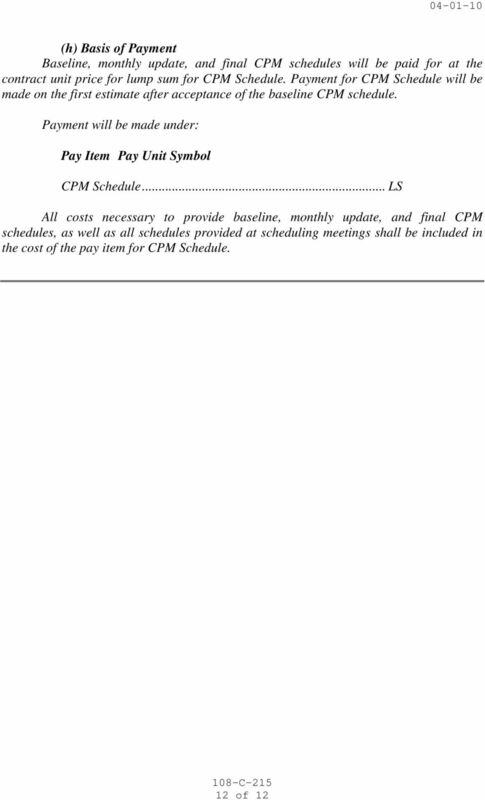 Resubmittal of a final CPM schedule shall be made within 14 calendar days of receipt of rejection notification. 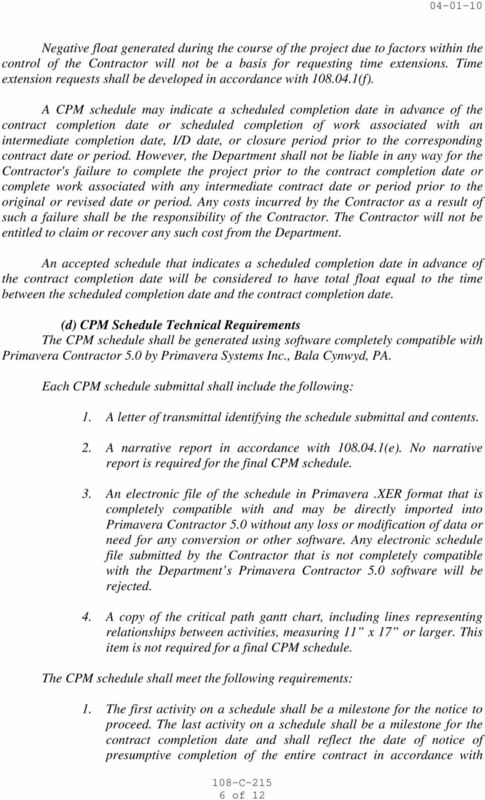 If the Contractor fails to resubmit a rejected final CPM schedule by the required date, the Department will withhold progress estimates until the final CPM schedule is submitted. 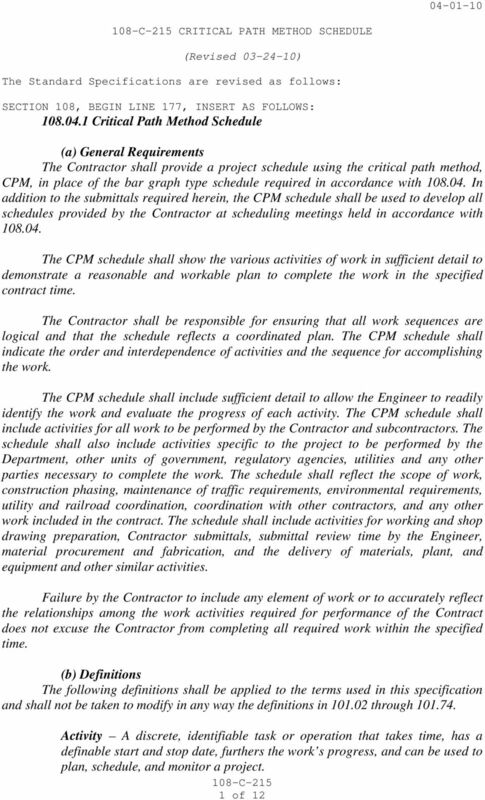 The Engineer s review of a submitted schedule will be for compliance with the specifications. Acceptance by the Engineer does not relieve the Contractor of responsibility for the accuracy or feasibility of the schedule. 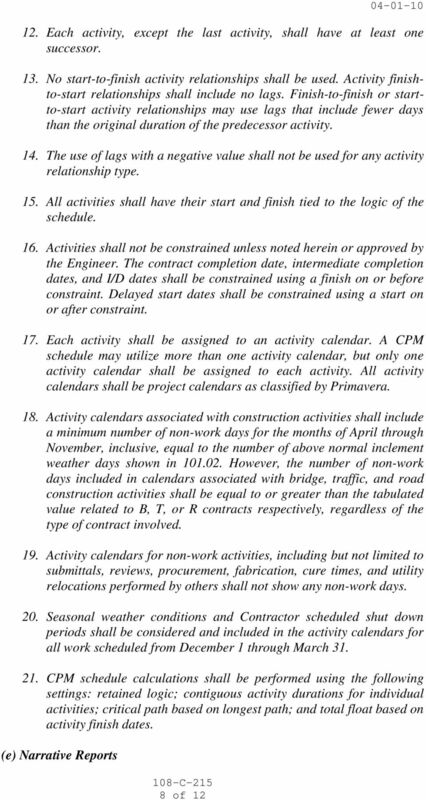 Acceptance of a schedule does not constitute a modification of the contract or endorsement or validation of the Contractor's logic, activity durations, or assumptions in creating the schedule. Acceptance of a schedule does not guarantee that the project can be performed or completed as scheduled. Omissions and errors in a CPM schedule shall be corrected in the next CPM schedule submittal and will not entitle the Contractor to a contract adjustment. 5. Float and Scheduled Completion Total float belongs to the project and shall be a shared commodity between the Contractor and the Department. Float is not for the exclusive use or benefit of either party. Either party has full use of float until is it depleted. Float generated during the course of the project due to the efficiencies of either party shall be considered to be part of total float. Float generated during the course of the project due to favorable weather within a calendar month, where the number of days of inclement weather is less than the normal inclement weather days for the month, shall be considered to be part of total float. 11 11 of A description of the work performed since the last accepted submittal. 9. A description of and explanation for any changes between the work performed since the last accepted submittal and the work planned at the time that submittal was made. 10. A detailed description of any unresolved problems that are anticipated or that have been encountered. If a contractual notice of a changed condition or a claim in accordance with has been submitted and the Department response is pending, the description shall indicate the date of the notice or claim submittal. 11. A statement that identifies any unresolved actual and anticipated delays. The statement should include identification of the delayed activity, the party apparently responsible for the delay, the type of delay, the cause of the delay, the effect of the delay on other activities and project milestones and identification of actions required to mitigate the delay. If the Contractor has submitted a request for additional contract time in accordance with (f) and the Department response is pending, the statement shall indicate the date of the Contractor request. 12. A detailed description of the critical path. 13. A list of activities which have become critical since the last accepted submittal. (f) Extension of Contract Time If the Contractor believes work on the contract has been delayed for reasons beyond its control, a written request for extension of contract time may be submitted in accordance with The Contractor s request for extension of time shall be submitted in conjunction with the first monthly update CPM schedule submittal that is made after the delay mitigation work is complete. 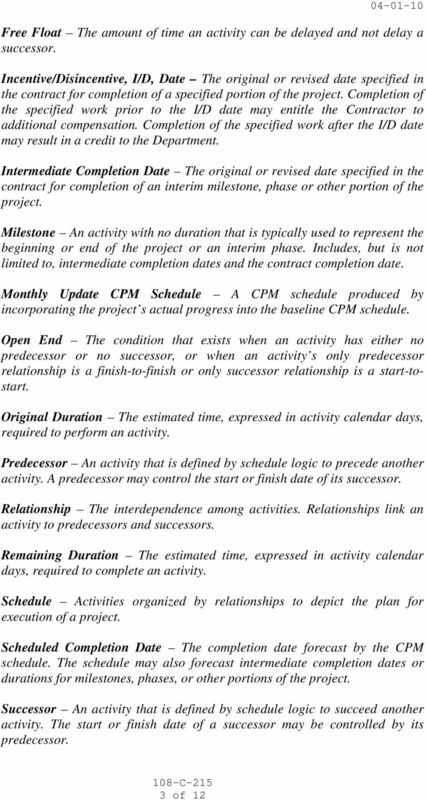 A monthly update CPM schedule which accompanies a time extension request shall utilize a data date which is the date that the delay mitigation work is complete. 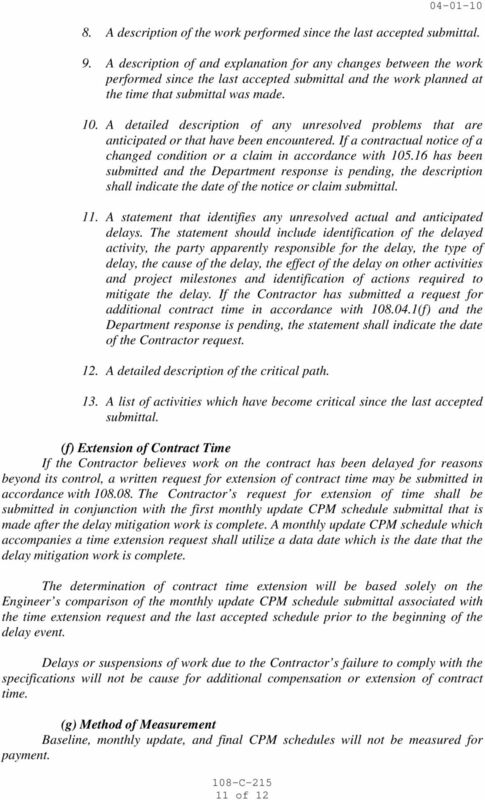 The determination of contract time extension will be based solely on the Engineer s comparison of the monthly update CPM schedule submittal associated with the time extension request and the last accepted schedule prior to the beginning of the delay event. Delays or suspensions of work due to the Contractor s failure to comply with the specifications will not be cause for additional compensation or extension of contract time. (g) Method of Measurement Baseline, monthly update, and final CPM schedules will not be measured for payment.